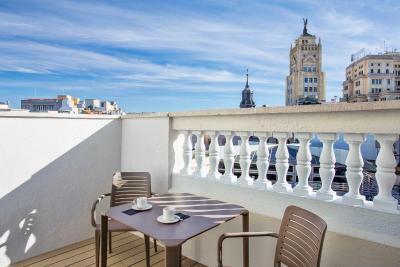 Lock in a great price for Catalonia Gran Vía – rated 8.8 by recent guests! Location is excellent almost close to everything. sta are friendly and helpful, room was clean. Location is fantastic, and hotel interior was nice, old classic. 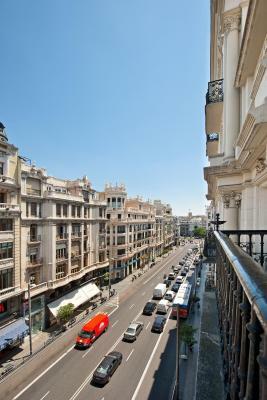 Rooms were large and beautiful with balcony overlooking Grande Via. Beds extremely comfortable. Staff always helpful and friendly. 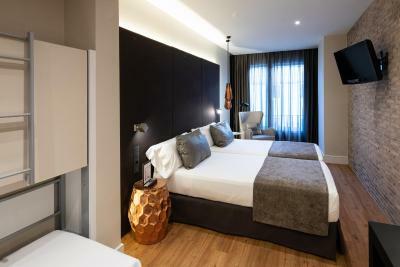 Beautiful rooms, great location, central albeit in a very busy main avenue. Great hotel amenities. The room balcony, location and friendliness of the staff. Location is great. Friendly staff. Bathroom is new and modern. Bed was comfortable. They let us in way before check in time. Great location; room was renovated, comfortable and clean as expected for the price. Javier was such a hard worker and very efficient at his job. 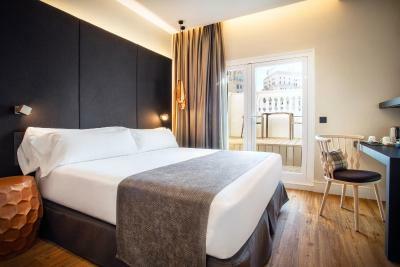 Catalonia Gran Vía This rating is a reflection of how the property compares to the industry standard when it comes to price, facilities and services available. It's based on a self-evaluation by the property. Use this rating to help choose your stay! 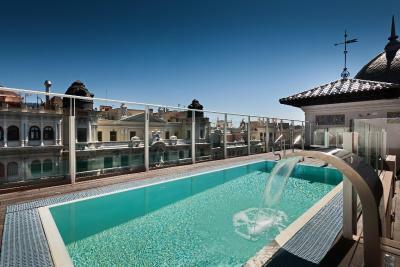 One of our top picks in Madrid.Catalonia Gran Vía offers a terrace with a pool and views over Gran Via. There is free Wi-Fi, a spa and small gym. 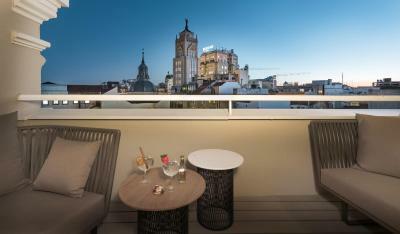 It is located in central Madrid, between Puerta del Sol and Plaza de Cibeles. Built in 1917, this charming building features beautiful stained-glass windows. 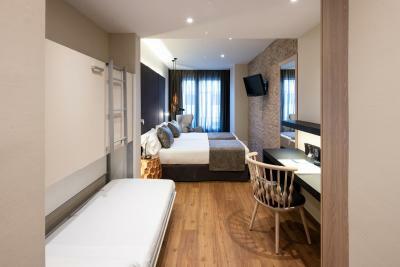 The rooms are decorated in neutral tones and come with satellite TV and a private bathroom with a hairdryer. 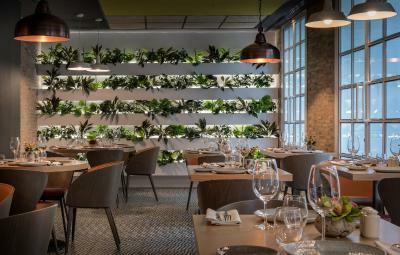 The restaurant serves Mediterranean and international cuisine. 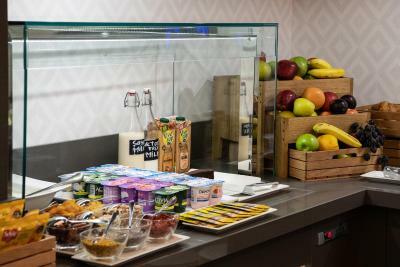 A buffet breakfast is available and the hotel’s bar offers a range of cocktails. The hotel also has a lounge and an internet corner. 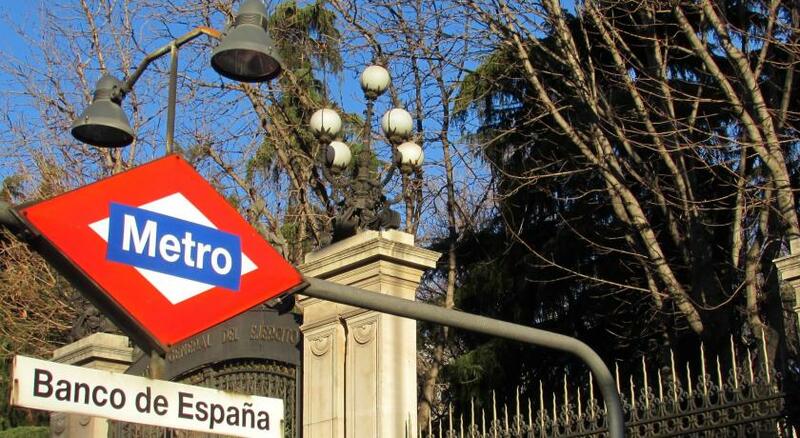 The Reina Sofía, Thyssen-Bornemisza and Prado Art Galleries are less than 10 minutes’ walk from the Catalonia Gran Vía. 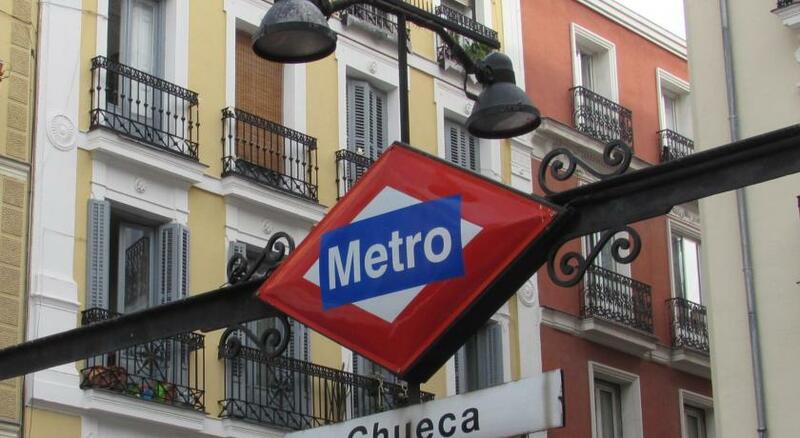 Atocha Station is 20 minutes’ away by foot, with a high-speed AVE service. 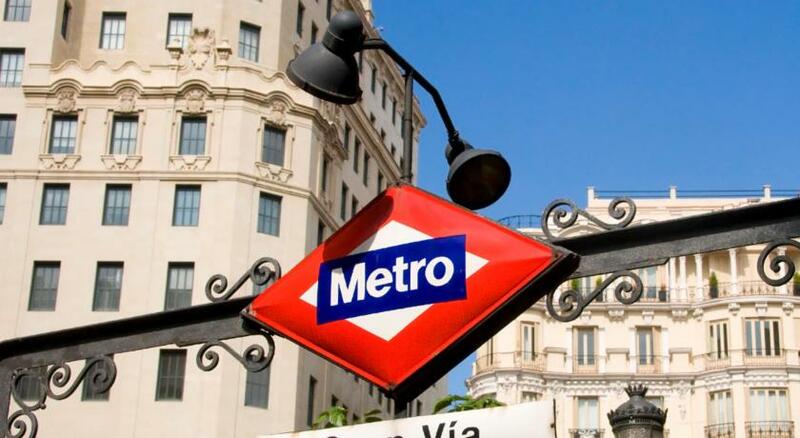 Madrid City Center is a great choice for travelers interested in tapas, architecture and parks. 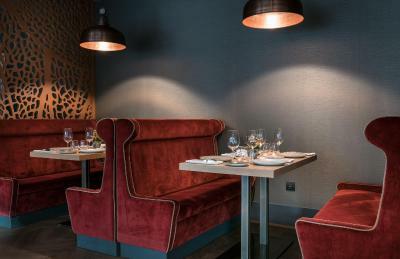 This is our guests' favorite part of Madrid, according to independent reviews. This property also has one of the top-rated locations in Madrid! Guests are happier about it compared to other properties in the area. 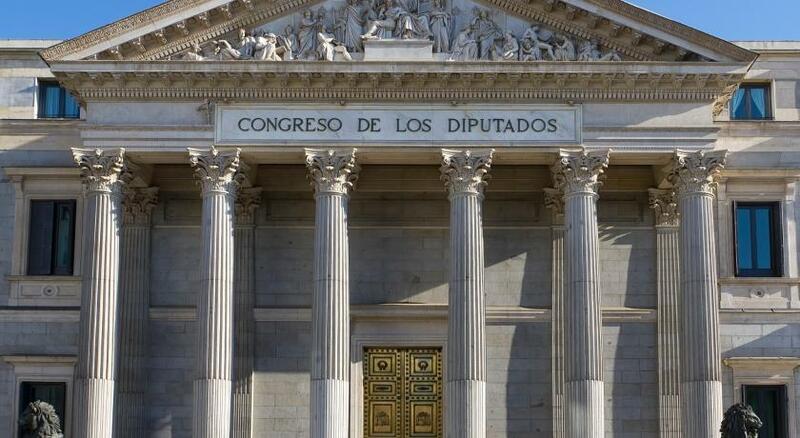 This property is also rated for the best value in Madrid! Guests are getting more for their money when compared to other properties in this city. 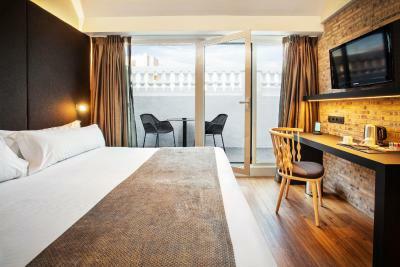 When would you like to stay at Catalonia Gran Vía? This room is decorated in stylish neutral tones. It includes free Wi-Fi, satellite TV and a private bathroom with a hairdryer. This room is decorated with stylish neutral tones. It includes free Wi-Fi, a flat-screen satellite TV and a private bathroom with a hairdryer. 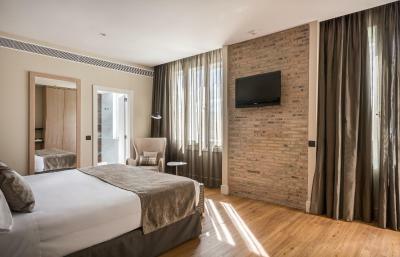 Decorated in stylish neutral tones, this suite is located on one of the top floors of the hotel. 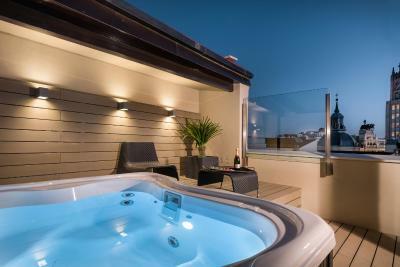 It features a private terrace with city views, as well as sun loungers and a hot tub. It comes with a free bottle of water and a box of chocolates. This room also includes free spa access and a turn-down service. 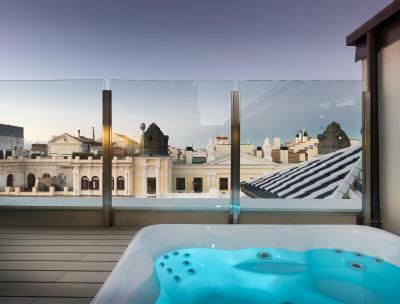 Located on the higher floors of the hotel, this superior room features a private terrace with a Jacuzzi® for up to 5 guests and impressive views of Madrid's skyline. 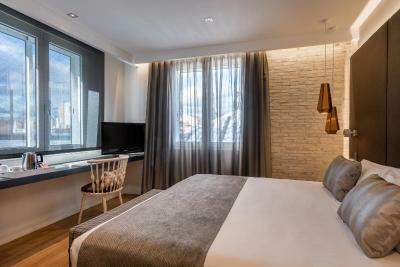 It includes a king-size bed, flat-screen TV with satellite channels, free WiFi, universal chargers and USB port, and coffee and tea facilities including a Nespresso® coffee machine. 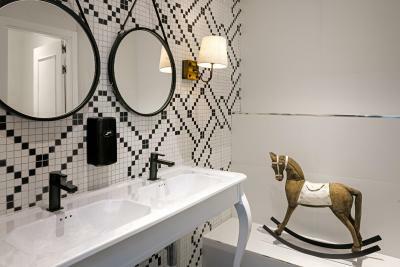 The private bathroom comes with a large rainshower, VIP toiletries, bathrobes and slippers, hairdryer, and make-up mirror. This room includes 1 bottle of water, a box of chocolates, and turn-down service, as well as free access to the Alegría Spa. Decorated in stylish neutral tones, this room has city views. It includes free WiFi, flat-screen satellite TV and a private bathroom comes with a bathrobe, slippers, a hairdryer and luxury toiletries. There is free water, and a box of hazelnut chocolates. This room also includes free spa access and a turn-down service. 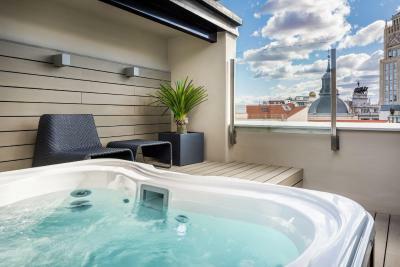 Located on the higher floors of the hotel, this suite features 2 private terraces, including a Jacuzzi® for up to 5 guests and impressive views of Madrid's skyline. 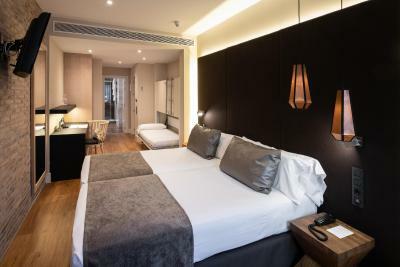 It includes a king-size bed, separate living space, 2 flat-screen TVs with satellite channels, free WiFi, universal chargers and USB port, and Nespresso machine. 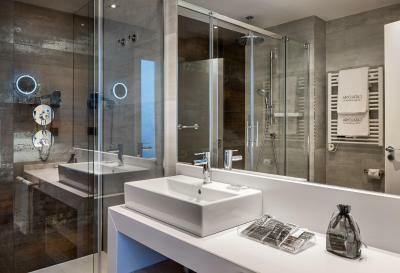 The private bathroom comes with a large rainshower, VIP toiletries, bathrobes and slippers, hairdryer, and make-up mirror. 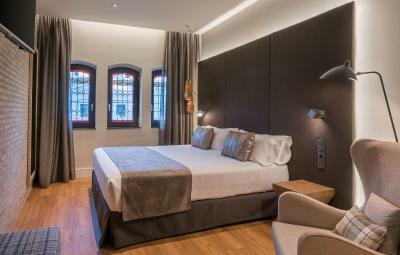 This room includes 1 bottle of water, a box of chocolates, daily and turn-down service, as well as free access to the Alegría Spa. This premium room features stylish modern décor and a 32" TV. It provides free Wi-Fi, and the bathroom includes a bathrobe and slippers. There is free water and a box of hazelnut chocolates, as well as tea and coffee-making facilities. 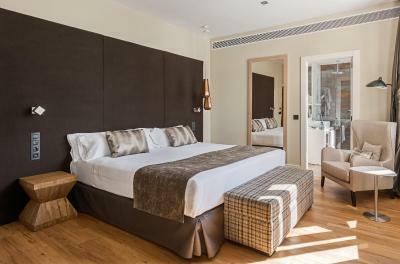 This room is decorated with stylish neutral tones and offers views of Gran Vía Avenue. 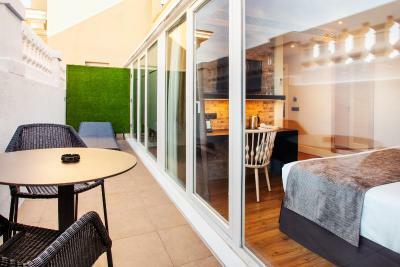 It includes free Wi-Fi, a flat-screen satellite TV and a private bathroom with a hairdryer. There is free water and a box of hazelnut chocolates. This room includes a cross-trainer fitness machine and fitness kit consisting of mineral water, Aquarius sports drink, and 2 extra towels. There is also a Nespresso® coffee machine. The mattress is equipped with a memory-foam top. This family room has a mini-bar. 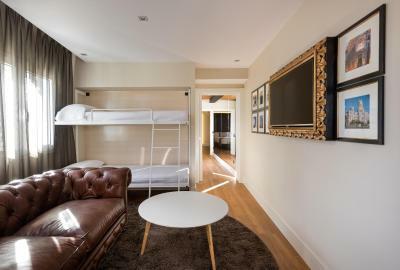 This double room features a mini-bar, bathrobe and air conditioning. 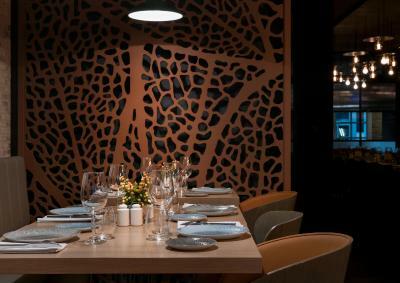 Come and enjoy Catalonia Gran Via! 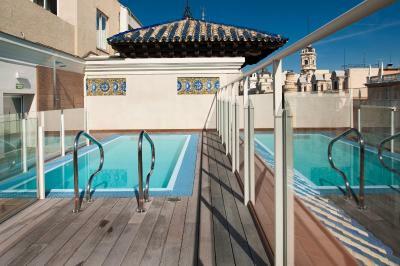 With a Pool, Wellnes & Spa and Fitness this hotel brings Madrid to your doorstep. 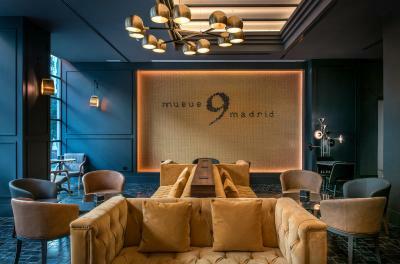 Its strategic location placed in the famous Gran Via, means all the sights of this exciting city are within walking distance. 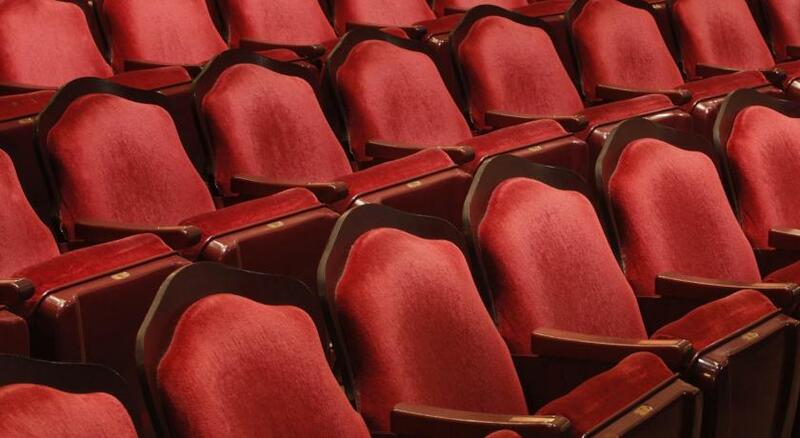 Whether you are visiting on business or on vacation, we´ll make you feel at home. With our warm service and treatment, you would love to return before your leaving. 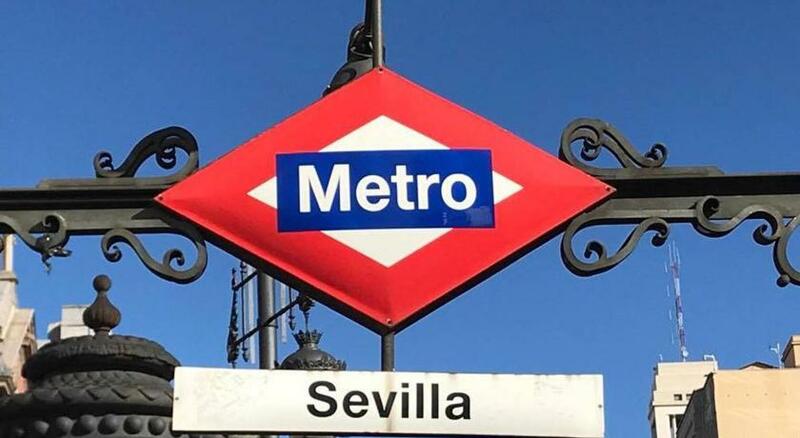 Hotel surroundings – This neighborhood is a great choice for travelers interested in tapas, architecture and parks – Check location Excellent location – show map Guests loved walking around the neighborhood! 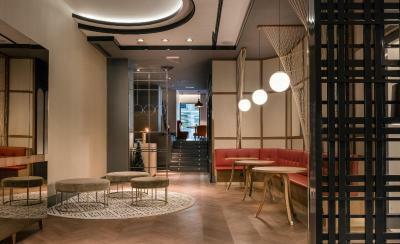 House Rules Catalonia Gran Vía takes special requests – add in the next step! Catalonia Gran Vía accepts these cards and reserves the right to temporarily hold an amount prior to arrival. For guests staying in rooms without spa access included, a spa session costs EUR 10 per person. Guests must contact the hotel in advance to arrange spa access, as places are limited and subject to availability. Please note, when booking more than 4 rooms, different policies and additional supplements may apply. 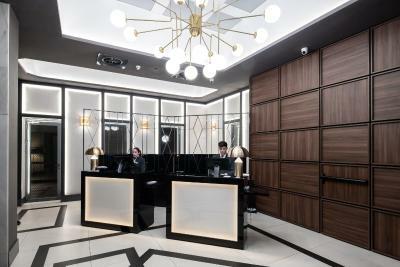 Once a reservation is confirmed, the hotel will contact you to arrange payment in advance. Children between 14 and 18 are admitted to the spa if accompanied by an adult and children under 14 years are not allowed in the spa. Please note that the spa is open from 11:00 to 21:00 and the gym is open from 07:00 to 23:00. Please consult special timetables during the Christmas period. Please note that only 1 pet, dogs or cats under 20 kg, are allowed in the hotel and upon prior request. A deposit of EUR 200 is required upon arrival for incidentals. This deposit is fully refundable upon check-out and subject to a damage inspection of the accommodations. 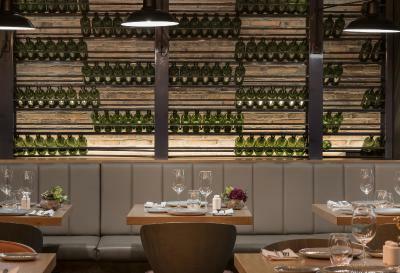 Credit cardholder must match guest name or provide authorization. The standard double room don't have kettle for hot water. The staff are the worst I've experienced in a long time. Check-in was a desaster and the guy called David insisted on getting the VAT no without using the English word or saying what it is, when I showed the number he said he doesn't speak my mother tongue and refused to help me. Afterwards he gave me on purpose a downgrade (on my receipt I got another room number!) and I got the worst and loudest room in a floor under construction, even though I asked for a quiet room already when booking. It was getting even worse: the room was FULL OF HAIR, on the bed linen, pillow, the shower and bathroom full of hair, I called the reception, someone came and checked it and left. That was at 10:00 pm at night, and NOTHING happened, I waited for 40min if I get new sheets, if someone would clean the bathroom or if I get another room and NOTHING. So I had to asked the next morning for a new room - again, I received another loud room towards the street even though they had many other rooms. In both rooms the wollen blakets underneath the bed linen were disgustingly dirty and again long hair everywhere... Even though I gave my company address the day before and asked to have the invoice ready at check-out, early in the next morning nothing was ready, the guy started to put the address in, made mistakes, didn't know how to change it in the system and it took 15min to receive a bill while I was in a hurry to get to the airport! I do not recommend this hotel to anyone! the location is in the city center - though directly at a very loud, big street. Everything was fine, there wasn't anything I didn't like. 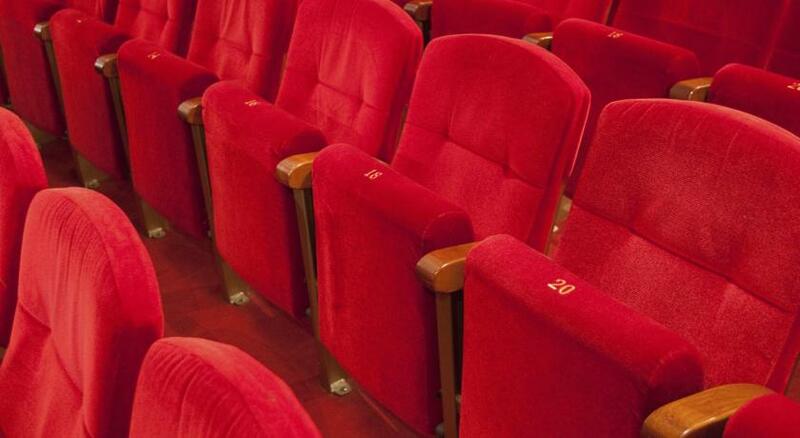 Cleanliness and decor, helpfulness of staff, location. 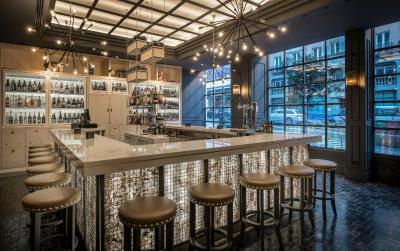 The restaurant / bar in the hotel was lovely but pricey. 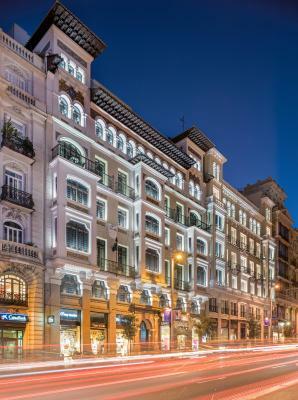 The hotel was in the perfect location on the main Gran Vía street meaning shops, restaurants & bars could easily be found within a short distance. The bed was very comfortable and the shower was the best I’ve had! One of the elevators had a bad smell. I think it was something with the new wallpaper and the glue that was off. 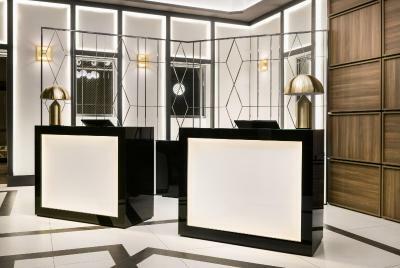 Much of the hotel were under renovations so the corridors and the doors at some of the floors didn´t look as nice as all the rooms that were great. The location of the hotel was great. The showers were fantastic and the cleaning was very good. The view from the hotel was also very good. Not a nice place.The receptionists are not doing much and are not there to help you, very slow. The spa at the hotel was not available for the WHOLE trip as they were painting the walls!! 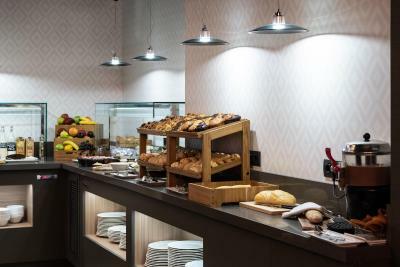 Nowhere was it mentioned obviously.. manager not available..the rooms itself are ok, breakfast is ok, nothing exceptional compared to other hotels. Very noisy room, 7 floor. spacious room and bath room is top clear and new .